The burger: After a supply chain-mandated hiatus, the goat burger is back at the Curious Goat. Cue the fireworks. The bright orange truck is a fixture outside Sociable Cider Werks in northeast Minneapolis, and while chef/owner Ian Gray knows his way around beef sliders -- so juicy, so onion-packed, so life-affirmingly delicious -- he’s made something of a career out of singing the praises of a goat burger, starting back when he had it on the menu at his marvelous, but depressingly short-lived restaurant, the Gray House. Not long after closing his Lyn-Lake gastropub in 2014, Gray announced that he was getting back into the business with a food truck, and the news was even better: he was going to continue to feature a goat burger, made from the lean, pristine meat that he had been sourcing from cheesemaker Lynne Reeck and her Singing Hills Goat Dairy in Nerstrand, Minn.
What is it about goat meat? Present company definitely included. Anyone who appreciates a well-prepared lamb burger will flip for Gray’s goat version. Compared to its lamb counterpart, the meat’s barnyard bite is more of a whisper than a shout. By the way, Gray is right; it was seemingly born to embrace burger-friendly flavors. For seasoning, he turns to salt and a hefty dose of red pepper flakes, and once growing season jumps into full swing, Gray, a devoted farmers market shopper, will also be tossing in a garden-fresh mix of herbs, from favorite purveyor Dehn’s Garden. Young goat (we’re talking 9- to 12-month-old animals) is an exceedingly lean meat, so Gray ingeniously bumps up the fat factor by cutting in some of Reeck’s chevre. It’s not unlike those crazy-rich beef burgers enriched with butter (yes, Constantine, I'm talking to you), only this time it’s front-loaded with terroir-suggesting flavor properties. You want to get a hint of what the rolling grasslands near Northfield taste like? Order this burger. The patties weigh in somewhere in between five and six ounces (Gray originally started at seven ounces, but the thick patties were taking 12 to 15 minutes to cook, “and that’s too long for people to have to wait,” he said) and they get fried on a flattop grill. The grill’s heat melts the cheese, and that moisture helps to crisp the meat’s outer shell; when it’s pulled off the stove, the patty’s interior remains slightly pink and creamy. Toppings are simple, and flavor-enhancing, just a generous handful of peppery arugula and a thick, slightly melted slab of Reeck’s no-frills farmer cheese. The bun? It’s whole wheat. Yes, it does. And toasting only accentuates those hearty, nutty flavor notes. This is a first-rate burger experience (no surprise, since Gray operates a first-rate food truck), and a happy excursion off the well-worn beef trail. One caveat: the Gray’s goat burger goes on and off the menu as supply dictates, so expectations should be set accordingly. Fries: None. Instead, Gray applies his deep-frying virtuousity to cheese. When he pulls Reeck’s delicate, teasingly tangy and obviously fresh goat cheese curds (“I picked them up this morning at Singing Hills, that’s how fresh they are,” he said when I ordered them) from the fryer, the results are nothing short of spectacular. Still, if you've dropped in on one of the rare days when Gray is dabbling in a different kind of fried-cheese splendor, by all means, order it. Ok, “sticks” is something of a misnomer. No wonder. They’re dangerously addictive, with a thin, delicately crunchy coating that gives way to wonderfully fresh and clean-tasting cheese. 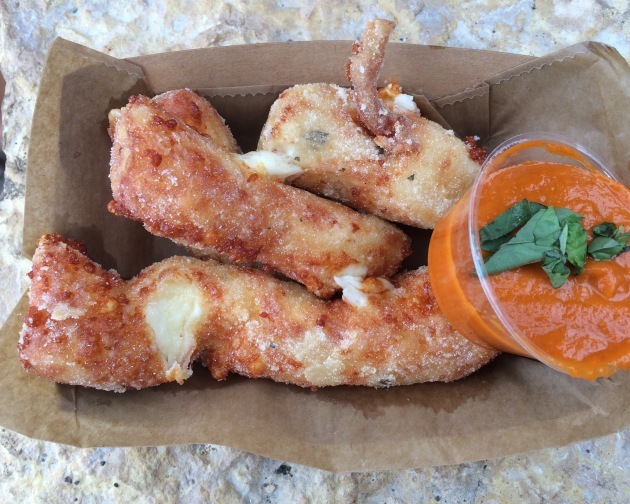 Each calorie-laden basket ($9) is served with a gutsy, chile-fueled marinara dipping sauce. The only downside? Once again, limited supply. A second truck: Gray is getting ready to inaugurate his second roving restaurant, the Smoking Cow. “It was going to be either pig or cow,” he said. “But we love Andy Peterson at Peterson Limousin Beef, so we went with cow.” It’s making its debut next weekend: find it May 5 at Badger Hill Brewing and May 6 at Bad Weather Brewing Co. The plan is to have the truck spend most of June and July at Tattersall Distilling. Next week’s menu will include a smoked brisket sandwich and tacos with Red Table pancetta and Lone Grazer cheese curds. Oh, and cow’s milk cheese curds, from Lone Grazer. Gray will also be serving his version of the Pronto Pup, which features Red Dog all-pork hot dogs from Red Table Meat Co., and a gluten-free batter. For home cooks: Want to prepare your own goat burger? Seward Co-op carries a limited supply of ground goat meat from Peters Family Farm in Fountain, Minn. Address book: Gray parks the truck (yes, technically it’s a trailer) outside Sociable Cider Werks, 1500 Fillmore St. NE., Mpls., 612-758-0105. Find it there Thursday through Sunday. “We mirror their hours,” said Gray, so that means 4 to 11 p.m. Thursday, 4 p.m. to midnight Friday, noon to midnight Saturday and noon to 9 p.m. Sunday. Follow Gray on Twitter: @CuriousGoatMN.